See Classes & Retreats for information on on-going classes and upcoming retreats. See Media page to order Heloise’s book and DVD. “Heloise uses playfulness and an intuitive responsiveness to each student. _T'AI CHI is an ancient Chinese form of movement meditation that benefits the whole person - physical, emotional, mental and spiritual. Its fluid, graceful, and grounding movements help to cultivate feelings of well-being, centeredness, serenity, and strength. T’ai Chi is one of the leading techniques used today to help reduce stress-related imbalances, including high blood pressure, anxiety, joint pain, headaches and indigestion. It contributes to improved bone mass, balance and agility. Heloise teaches with an understanding of the physical process as well as the deeper wisdom embedded in this practice. She encourages the practitioner to develop the ability to listen within, release tension and connect to the natural healing forces in the universe. Her students have included young people, elderly, business executives, jail inmates, artists, professionals and people from all walks of life. Heloise trained with the highly regarded Master Da Liu, of The T'ai Chi Society of New York, and Chi Gong Master T.K. Shih, and in Austin with Chi Gong Master Li Jun Feng and Dr James Wu. Heloise has served on the faculty of The Academy of Oriental Medicine at Austin (AOMA) (1993-1994 and 2004-2006). 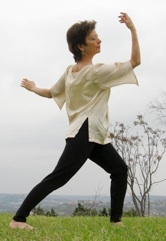 She has taught private and group T’ai Chi/Qi Gong classes in Austin since 1978. Heloise has taught annual week-long retreats at Rose Mountain Retreat Center Las Vegas NM (1984-present), and workshops at The Crossings Austin (2002-2007), The School of Nursing at The University of Texas Austin (1996-1998), Lauterstein Conway Masssage School Austin (1994-1998), The Yoga Institute Houston (1993-1998), and The Lama Foundation NM (1985).